While getting ready to travel to Iran, you will notice there are lots of authentic landmarks and monuments to visit in each part of the nation. Shiraz is also an antiquated city with several ancient attractions still remaining in good conditions. 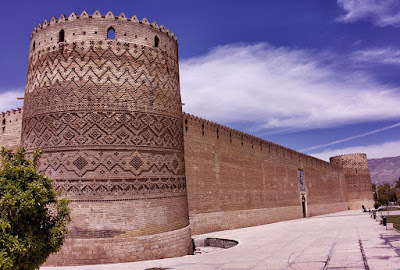 The Citadel of Karimkhan, one of the most magnificent fortresses in Iran, is a remarkable example of the 18th century combination of two military and residential architectures. The most important building of Zand dynasty is a square-shaped citadel located in the center of Shiraz. It was built as part of a complex and is named after Karim Khan, and served as his living quarters. It has four circular towers on the corners, one of which on the southeastern side has a distinctive slope. The citadel is spread over 5 hectares and the height of each tower is 14 meters. There is a large tile depicting the scene of killing of the white devil by Rostam, a hero of Shahnameh, at the entrance gateway of the citadel. Actually, the ornamented decoration of building is typical of that era. At times, the citadel was used as a prison. Today, it is a museum operated by Iran's Cultural Heritage Organization. While traveling in Shiraz, do not hesitate to offer yourself this masterpiece of architecture which is registered as a National heritage site.